作者: The AsiaN Editor on 26 October , 2018. Politically, the world is more dangerous and unpredictable than it was just a couple of years ago. Seemingly overnight, following Britain’s unexpected vote on June 23, 2016, to withdraw from the European Union and the election of Donald Trump as US president in November of the same year, confidence in liberal democracy is at a low point. The rise of far-right nationalist parties in Western Europe and the emergence of authoritarian governments in Hungary, Poland and elsewhere along with the weakening of constitutional norms and the emergence of existential threats to free media and open societies have raised worries about what has happened to the once-confident post-Cold War assertions of an “End to History” and the triumph of liberal democracy. A simple explanation is to focus on economic changes. The 2008 financial crisis, the spread of globalization and the relative shift in the center of economic gravity from West to East have undermined the wellbeing of once secure middle-class societies in Europe and North America. Individuals have had to adjust to sharply diminished lifetime income expectations, and the rising costs of education, housing, welfare and retirement. However, this brake on the confident belief in the benefits of economic modernization is only one part of a more complex story. Equally important is the recurrence of cyclical patterns of political behavior that seem reminiscent of a more contentious and polarizing time, especially the upheaval of the interwar period in Europe in the last century. Much of this is evident in the shift toward a politics of anger, resentment and anti-pluralist exclusion, frequently rooted in the resurrection of historical national myths and themes. We can see this in Trump’s invocation of the “America First” campaign or the emergence of mass neo-Nazi demonstrations in Chemnitz in Germany, or the attempt to rehabilitate the reputation of Joseph Stalin in Russia. However, without minimizing the desire for recognition, this feels far too narrow an explanation. The power of identity politics and the related populist push is a much more multifaceted phenomenon. It not only involves a desire for recognition, but also, and perhaps paradoxically, a parallel instinct to deny that recognition to others. It is based on an exclusionary, judgmental and polarizing tendency that fosters conflict and stands in the way of consensus and accommodation. In the words of Jan-Werner Müller, an especially perceptive analyst of populism, it is based on “… a particular moralist imagination of politics, a way of perceiving the political world that sets a morally pure and fully unified — but … ultimately fictional — people against elites who are deemed corrupt or in some other way morally inferior.” At its most extreme, populism spills over not only into a rejection of elites, but a broader and much more destructive form of nihilism, a type of “negative solidarity” that is fueling what Pankaj Mishra has described as a new “age of anger.” Importantly, this tendency has deep historical antecedents and is reflected in the commentary of 18th and 19th century writers as diverse as the great Russian novelist Fyodor Dostoevsky, the German philosopher Johann Herder and the Italian nationalist Gabriele D’Annunzio. Hate-mongering against immigrants, minorities and various designated ‘others’ has gone mainstream — even in Germany, whose post-Nazi politics and culture were founded on the precept ‘Never Again.’ People foaming at the mouth with loathing and malice — such as the leading candidates in the US Republican presidential primaries who called Mexican immigrants ‘rapists’ and compared Syrian refugees to ‘rabid dogs’ — have become a common sight on both old and new media. Amid the lengthening spiral of ethnic and subethnic massacre and mutinies, there are such bizarre anachronisms and novelties as Maoist guerillas in India, self-immolating monks in Tibet, and Buddhist ethnic-cleansers in Sri Lanka and Myanmar. Such dangerous exclusivist and nativist tendencies have, of course, found an easy target for their energies in the backlash against immigration in a range of countries, whether or not the impact is materially threatening, benign or actually positive. 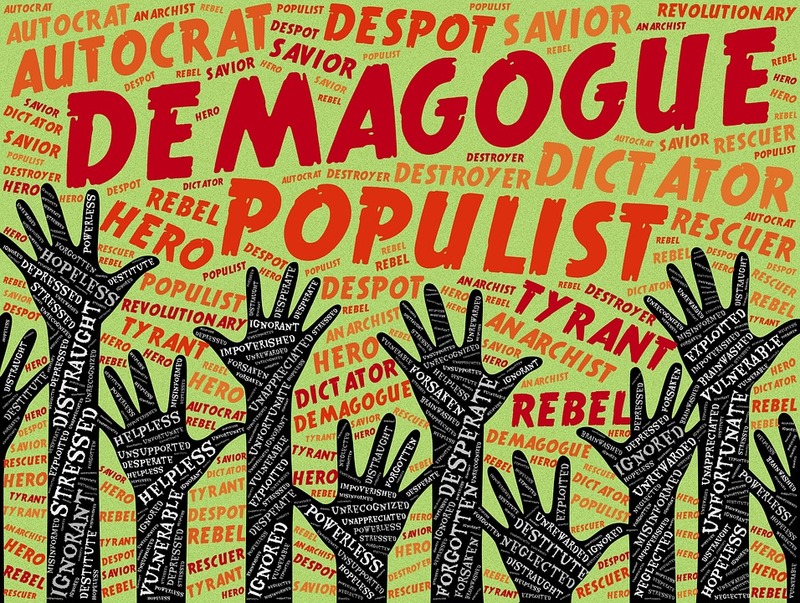 Unprincipled populist leaders and demagogues (such as Turkey’s Recep Tayyip Erdogan, Hungary’s Viktor Orban or Trump in the US) have used the fear of outsiders and the rise of resentment and identity politics to marginalize and stigmatize opponents, dismantle democratic safeguards and undercut the core assumptions of pluralist politics. Given the dangerous consequences of this return to political authoritarianism, it is understandable why some have spoken out forcibly against the return of identity politics. Fukuyama, for example, has stressed the need to transcend the desire for a sense of difference and exclusivity by focusing on assimilationist policies and the reinforcement of universal values such as the rule of law and human equality. Clearly, few would dispute the critical importance of these values, but to see them as the solution to meeting the basic drive on the part of individuals and groups towards exclusivity is to underestimate the power and instinctive appeal of the populist impulse. We … owe to romanticism the notion that a unified answer in human affairs is likely to be ruinous, that if you really believe there is one single solution to all human ills, and that you must impose this solution at no matter what cost, you are likely to become a violent and despotic tyrant in the name of your solution. The notion that there are many values, and that they are incompatible; the whole notion of plurality, of inexhaustibility, of the imperfection of all human answers and arrangements; the notion that there is no single answer which claims to be perfect and true — all this we owe to the romantics. At its worst, the romantic impulse can lead to a distrust of all forms of authority and the demonizing rejection of “fake news” — a trend amplified by the spread of social media. Less contentiously, it can help to explain the exclusive euphoria that animates national sporting success (such as the jubilant celebrations that gripped France during this year’s World Cup win), or the sense of collective unity that underpins many forms of patriotic national endeavor, such as America’s victory in the race to place a man on the moon. Importantly, this tendency to privilege emotion over reason can operate both on the left and right of politics and explains why populism is not confined to extreme right groups such as AfD in Germany, or the Swedish Democrats, but also appeals to the progressive forces of Podemos in Spain or Syriza in Greece. In some cases, such as the new 2018 Italian government, left and right populist forces have converged, in this case in the form of the coalition between the center-right League and the left-wing Five Star Movement. For the leaders and supporters of such populist movements, commitment to one’s own cause, at the expense of, and sometimes in direct opposition to, other political groups is uncontentious and often actively encouraged — a tendency neatly reflected in today’s megaphone political debate around Brexit in the UK. It explains the increasing tribalism of political life that we are seeing across the world, not just in the developed world, but in newly developing and rapidly industrializing countries such as Narendra Modi’s India, where Hindu nationalism has spawned violent and often deeply discriminatory policies against Muslims, often in the name of nativist historical myths of national identity. In other words, extremism can flourish in countries that are experiencing economic progress as well as retrenchment. To explain the powerful appeal of these exclusionary, collectivist forms of identity politics, we can turn not just to intellectual history, but also to new scientific research. The social psychologist Jonathan Haidt, for example, has made a powerful case that intolerance and self-righteousness is hard-wired into our way of viewing ourselves and others.10 Our moral sensibility is a product of our intuition, rather than our reason, and the values and norms that govern our societies function in Darwinian fashion to bolster and protect established communities. We cling to our moral beliefs, not because they are empirically true, but because they work to reinforce group solidarity and our exclusionary commitment to our own community at the expense of others. Consequently, we should be wary of assuming that we can easily accommodate the views of others based on reasoned argument — “the rationalist delusion” that Haidt sees as generally dominant in Western society. This does not mean that we should not try to be respectful and tolerant of the views of others; only that we should be wary of assuming that empirical evidence is either sufficient or even necessary to resolve differences between two communities equally animated by their respective identity-driven and frequently contentious historical narratives. This is true both between and within nations, whether, for example, between Brexiteers and Remainers in the UK or pro- and anti-Trump supporters in the US. Haidt’s “righteous mind,” Fukuyama’s stress on the desire for recognition, Mishra’s focus on anger and resentment, and Berlin’s account of the intuitive appeal of the romantic sensibility all in their ways help account for the rise of populist politics — a phenomenon that, in its particular manifestations in different polities, is itself varied and resistant to simplified generalizations. Harder to explain, at first glance, are those societies where the populist impulse appears not to have taken hold. A key case in point is contemporary Japan. By all accounts, Japan remains a mainstream polity. The governing Liberal Democratic Party (LDP) has been in power since 1955, save for a brief interlude in the mid-1990s and between 2009-2012. Prime Minister Shinzo Abe, and many of his senior colleagues, are classic establishment figures with long political pedigrees that extend as far back as the immediate aftermath of the Second World War. Abe’s father served as foreign minister in the 1980s, and his grandfather Nobusuke Kishi was prime minister between 1957 and 1960. The current deputy prime minister, Taro Aso is the grandson of former Prime Minister Shigeru Yoshida, who helped lay the foundations of Japan’s post-war economic development strategy and its relatively low-profile foreign policy for some 30 or so years after 1945. While there have been populist politicians, particularly at the local level, such as the former governor of Tokyo, Shintaro Ishihara, and his counterpart in Osaka, Toru Hashimoto, who have run as mavericks challenging the political center; both have failed to gain traction at a national level. The most recent instance of a national, populist pitch came from Yuriko Koike, the current governor of Tokyo, who during the last lower house election in 2017 formed a grassroots movement named Kibo no To (Party of Hope), in an effort to unseat the LDP. Her campaign fell apart at the 11th hour, largely due to a set of contradictory policy promises and her resistance to absorbing into her new party former left-wing members of the weakened opposition Democratic Party of Japan (DPJ). Populism’s apparent failure may reflect the absence of any major disruption to the economic system in Japan. Two to three decades of slow if not stagnant economic development have led to a diminution of Japan’s global economic status, but the pain of economic retrenchment has been gradual rather than abrupt. Nor has Japan, as a relatively homogenous society, had to confront the challenges of multiculturalism or mass migration that have been contentious in Europe. Even when the electorate has flirted with populist-style policies, such as the welfare-focused, redistributive policies of the DPJ in 2009-2012, administrative confusion, as well as the challenges of managing Japan’s triple disasters in March 2011, all helped to seal the electoral fate of the DPJ — a now much diminished and fractured party. Yet notwithstanding these surface differences, politics in Japan remains sharply divided over identity issues, and if anything, these divisions are likely to grow as Abe plans to push forward his contentious policy of constitutional revision should he be re-elected LDP leader this September. Next year will also see the inauguration of a new emperor, following the abdication in April 2019 of the incumbent Emperor Akihito. For many politicians on the right in Japan, especially within the controversial nationalist body, Nippon Kaigi (the Japan Conference), the start of the new era is an opportunity to revisit and re-emphasize some of the country’s more contentious historical narratives, by both downplaying the country’s excesses during the 1930s and stressing the importance of moral and patriotic education. By contrast, on the left of Japanese politics, the commitment to Article 9, the peace clause of the Constitution, has a totemic value that is less about a pragmatic detachment from global politics and more about a desire on the part of many Japanese progressives to find distinctive meaning in an emotionally authentic engagement with internationalism and the anti-nuclear movement. It is a simplification to frame Japan’s identity politics purely around these competing sets of core values; between the poles there exist subtle gradations of difference between moderates and extremists on both sides of the political spectrum. The important point to note, however, is that the exclusionary instinct and ideological commitment to a cause that animates identity politics and the romantic impulse is also at work in Japan and has arguably been a constant feature of much of its modern experience in the 19th and 20th centuries. Whether it has the potential to fuel a populist reaction at some point in the future is unclear, but given the unexpected speed with which such ideas have taken hold in countries such as the UK and US that once seemed impervious to such trends, we should be wary of assuming that Japan will continue along its linear, modernizing trajectory and remain resistant to the cyclical pattern of populist revival that we have seen elsewhere.